When Leonard Nimoy passed away last week, the internet was heaving with tributes for the Star Trek star. Now Nimoy has been immortalized in an official Star Trek product — the massively mulitiplayer role-playing game Star Trek Online. The two statues, which appeared in the game for the first time today, are placed on the planets of Vulcan and "New Romulus" (Star Trek Online is set in a post-Star Trek XI universe, where Romulus was destroyed in the events that created the parallel universe the JJ Abrams movies take place in). Aside from Vulcan as an obvious choice — and to mark the pilgrimage many players of the game took to the planet shortly after Nimoy's passing — New Romulus was chosen to represent Spock's work with the Romulan people after the events of the original series. 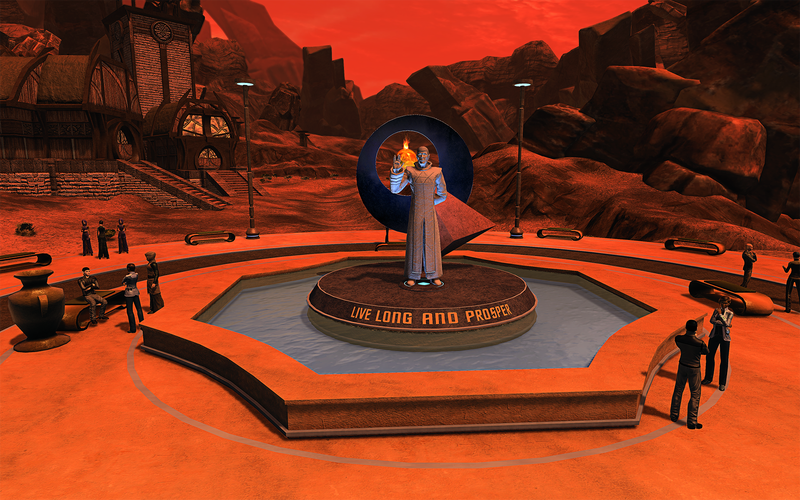 As well as the statues, for the next week Cryptic Studios will also display black flags in the game's three main hub zones, Earth Space Dock, Qo'noS and New Romulus. There will also be permanent plaques installed in each marking the passing of Nimoy and his fellow original series co-workers Majel Barrett, James Doohan, DeForest Kelley, and Gene Roddenberry.